Yesterday we set off to the NSW Art Gallery to have a look at the exhibition from the National Gallery of Scotland. We’d been there a number of times and its an amazing collection worth seeing time and time again. My husband was keen to see the show because he grew up with so many of those works – having spent many trips there as a kid. A bit of nostalgia. It was a long weekend and very hot and we had planned a picnic to follow the show. It was hot. Very hot. A burst of Australian summer heat in Spring. So of course the gallery wouldn’t be crowded. However it still surprised me that we could both find a park directly in front and that inside there were no queues. ?? Turned out the Scotland show wasn’t yet on – we were just fooled in thinking it was because of all the advertising (nb: read the fine print – or at least the pertinent details). No matter, it gave us an opportunity to wander about and look at the collection. We all went our separate ways, looking at whatever took our fancy, drawn from one work to another. The AGNSW has a wonderful collection, much of which isn’t shown (hence their proposed expansion) but they do curate shows from their collection and these were wonderful. Here are just a few of the works that made me smile. 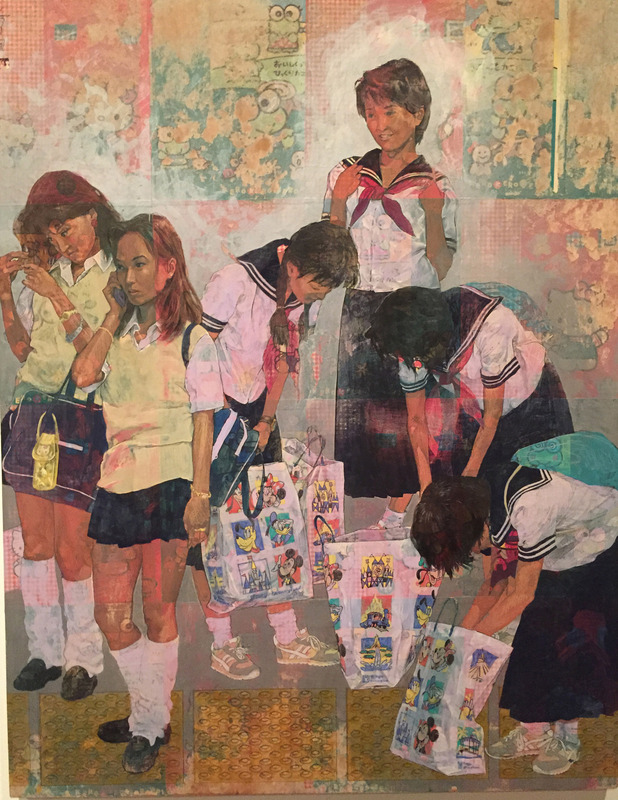 Paul Chan’s “Oh why so serious”, 2008. 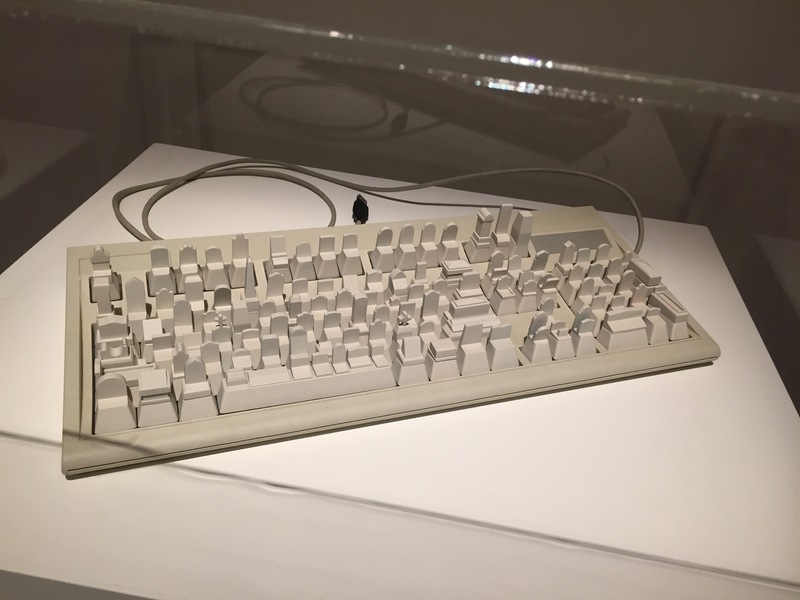 I loved this – the keyboard comprising of gravestones which looked very much like those very old keyboards we used to use before there were colour computer screens – but when I noticed the title I literally laughed out loud. In the same collection was another ironic comment on our technologically driven age and a comment about how these devices have been relegated to the graveyard or prehistoric era. 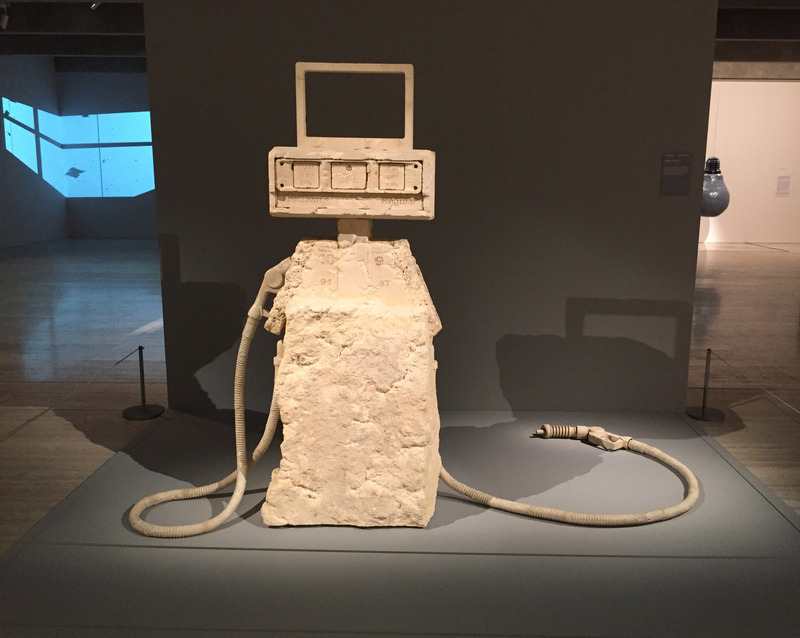 Petrified petrol pump is made from fossil-filled limestone. It is a provocative memorial to the ancient life forms whose decomposition, over the course of many millions of years, created the fuels that underpin contemporary society. Its form also resembles a tombstone, alluding perhaps to our doomed reliance on fossil fuels that threaten the extinction of countless species. I don’t usually go into the Asian galleries but some rather beautiful contemporary porcelain ware caught my eye. And I was very glad I wandered in. 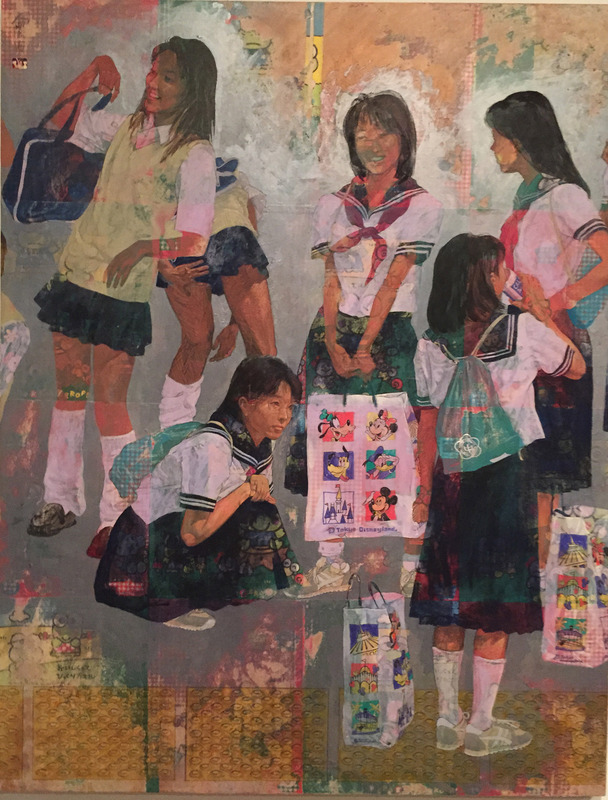 Conversations through the Asian collections brings together old and new works in a series of dynamic conversations where contemporary artists treat the art of the past as resource and spur to imagination. 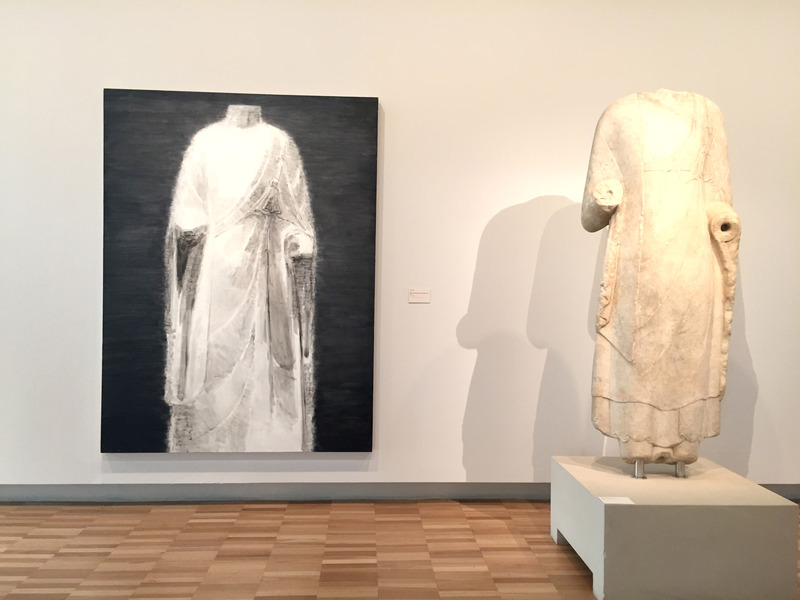 Contemporary works are placed beside the historical art that inspires and informs them. 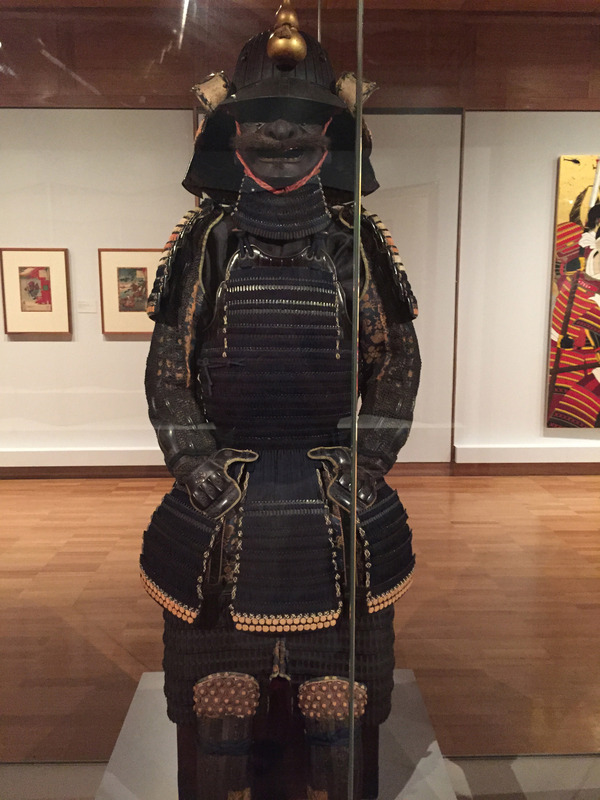 Some are laugh out loud clever, some are ingenious others are just amazing to look at, like this ancient Japanese warrior. 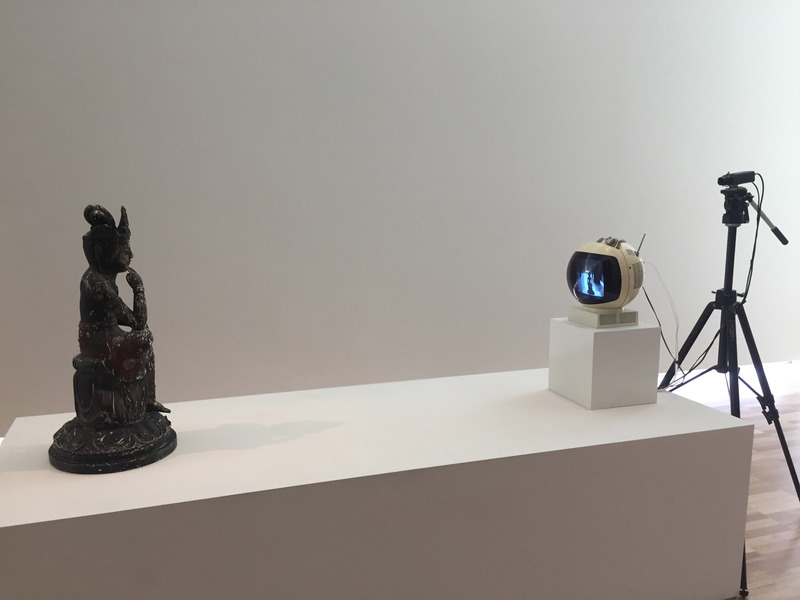 Nam June Paik’s TV Buddha is another lol moment; the Buddha perpetually gazes at the TV screen, on which he sees an image of himself recorded by the closed-circuit camera. 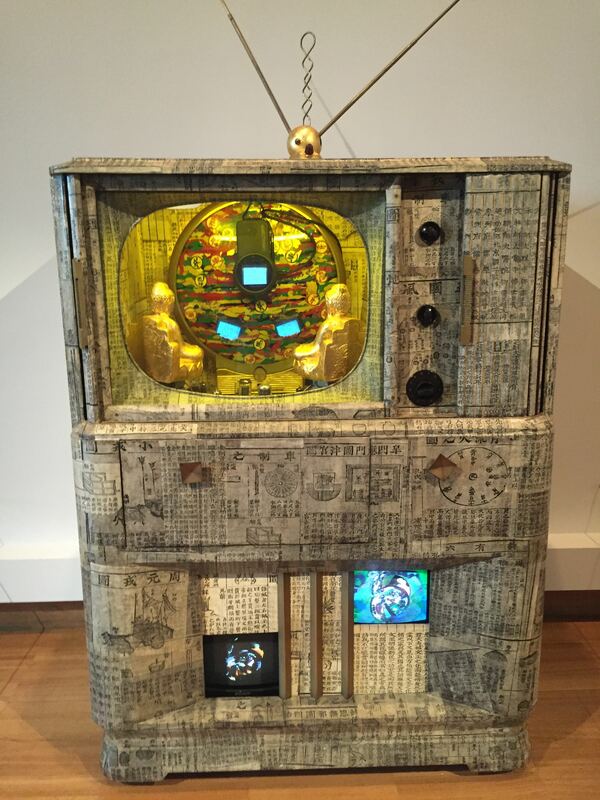 In a later piece, Buddha Game, two Buddhas sit in front of a screen inside an old-fashioned television set. The box that houses the work is a television cabinet within which miniature videos operating are watched by two bronze Buddhas. 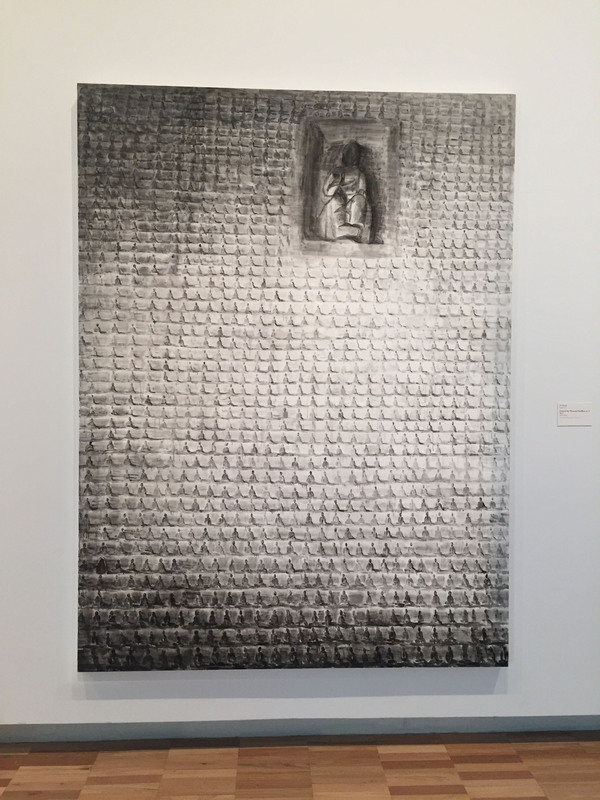 Confronting the spiritual dimension of Buddhism with new technologies is a continuing aspect of Paik’s work. The space of the screen where so many people “meditate” every day is provocatively juxtaposed with the sublime attention of Buddhist meditation. The cabinet is covered with pages from an old Korean book making the modern exterior of the appliance seem strangely antique. The other thing that struck me was just how interestingly this show had been curated bringing together a broad survey of old and new and by turn, reinvigorating them. Shi Zhiying, born in Shanghai in 1971 re-produces ancient Buddhist monuments into contemporary works. 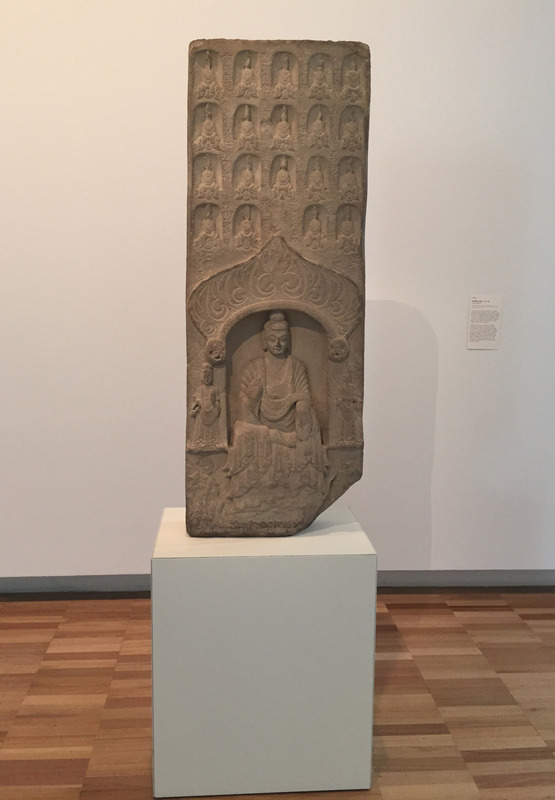 In Cave of ten thousand Buddhas no 3, a Buddhist stele is used as the basis of her large monochrome painting. Her work is very much informed by her reading of Buddhist scriptures and her deep understanding of Chinese history and traditional culture. 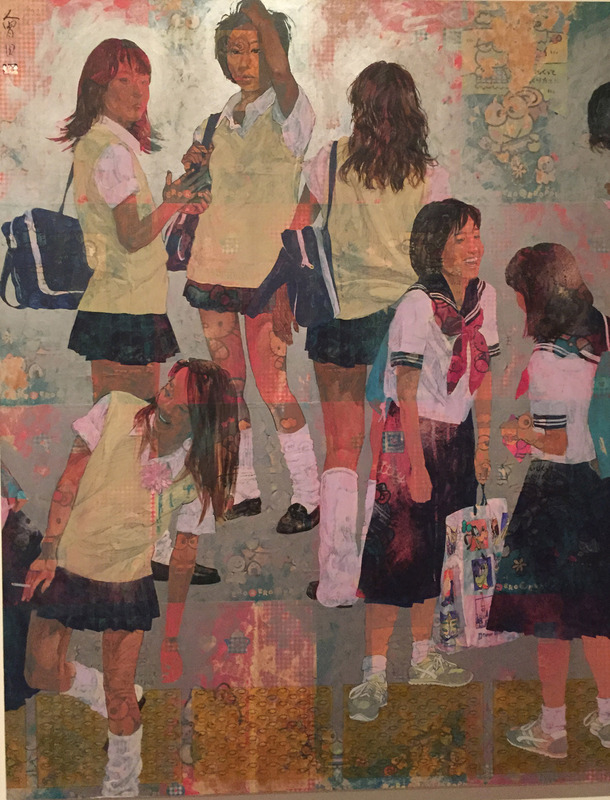 And finally, I was really taken with this work by Aida Makoto (Japan, b1965) Groups of girls 1997, mixed media on plywood. At first glance I dismissed it as being not very interesting but on closer inspection I thought it was brilliant. 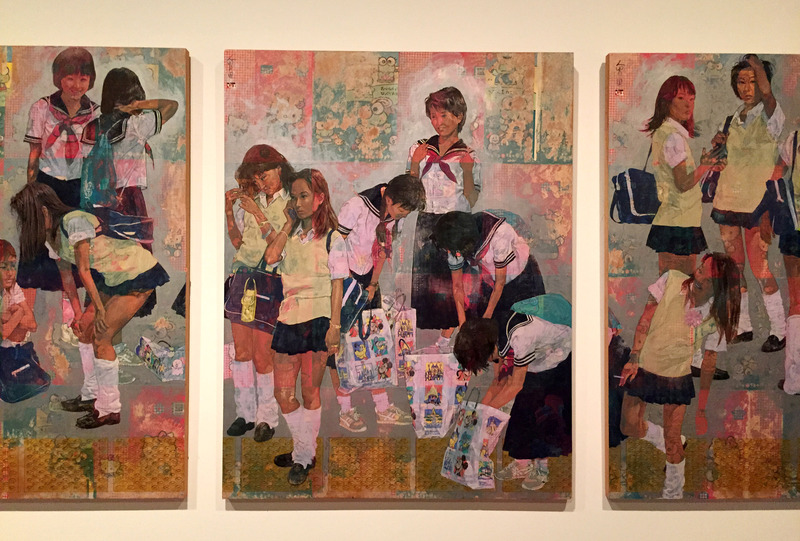 There are four panels depicting school girls. There are two groups – one from the countryside and the other from Tokyo – congregating on subway platform following an excursion to Tokyo’s Disneyland. The girls are evenly mixed over the confined pictorial space, creating a rhythmic uniformity. What you notice are the distinct differences in their appearance and behaviour. The girls from the country are in full uniform, correctly attired, neat and dowdy and somewhat old-fashioned looking. The city girls are like city girls everywhere – skirts as short as they can possibly be, socks worn in a fashionably slouchy manner, hair loose and accroutrements of mobile phones, cigarettes and jewellery. Their interactions with each other are also very different. 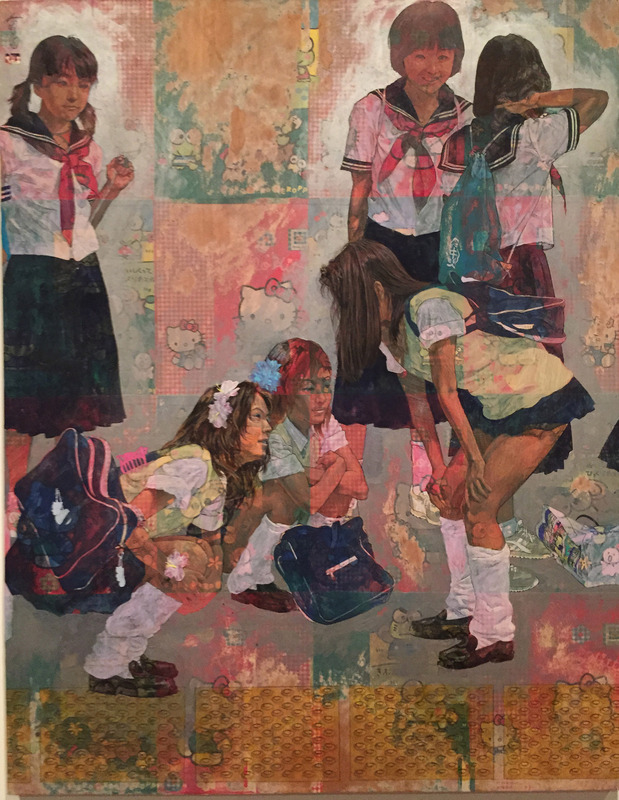 I also love the way that Makoto uses images of Japanese kitsch (Hello Kitty and Kero Kero Keroppi) as the background that unifies these groups. Brilliant. Well worth a stroll through on a day when there’s nothing else to do. Amazing what you discover.